Since there are many types of camera stabilizers which are for sale today, we bet you will have difficulty in deciding the most suitable one for yourself. 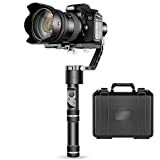 For your convenience, we have come up with this list of Best DSLR Camera Stabilizers & Gimbals in 2019, so we will introduce to you its features and special functions of each product. So, read on to attain this information. The very first product that you are going to hear from us goes to the camera stabilizer called MOZA Air Handheld Gimbal 3-Axis. This incredible product is suitable for many types of camera. More than this, with the 360-degree rotation and 2 handheld modes, you can freely shoot from different angles with ease. The camera is made of high-quality aluminum, so you can always trust its durability. With this awesome product in hand, we bet taking the video of beautiful sceneries and smooth, time-lapse videos will be more convenient. The gimbal can be mounted to sliders, tripods, cranes, and many more items. On top of that, as it is well equipped with the long-lasting battery life; it can run for 6 to 8 hours straight. Next, it is another ideal product for those who wish to get the perfect images from different angles. 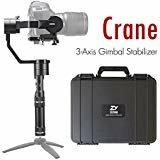 Zhiyun Crane 3-Axis Handheld Gimbal Stabilizer works perfectly well with the cameras that have the weight of 3.9 lbs. Moreover, for the convenience of taking the photos, this stabilizer is equipped with 360-degree rotation, too. Besides this, with the new innovative technology, you can also remotely access this device with iOS/Android app too. Set up is not a problem. Please be noted that the purchase also comes with 2 batteries, charger and more. Here we have the Zhiyun Crane V2 3-Axis Handheld Gimbal Stabilizer. The first special feature of this product is, the set-up process of this tripod is very easy and simple; it can be done in less than 1 minute. On top of that, with the equipment of the brushless motor, you can freely shoot your videos smoothly and noiselessly. The gimbal can be controlled wirelessly as well. Material used to produce the item is CNC aluminum alloy. The joystick is just at your fingertips, so you can always switch between different modes quickly and easy. Its battery has a 12 hour run time. More than this, the product is well made from the high-quality aluminum alloy, so the company of this product is willing to offer 1-year warranty. 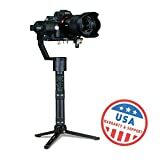 EVO Rage Gen2 3 Axis Gimbal for DSLR & Mirrorless Cameras, this great stabilizer which can work well with most cameras that have the weight under 1800g. On top of that, for the convenience of the users, this stabilizer is designed with the CCI technology that allows you to control your camera using the cable. And, its battery life is 12 hours. For your information, this product is highly recommended for DSLR and mirrorless camera. If you are concerned about the quality, fear no more, this product is also backed by a 1-year warranty. 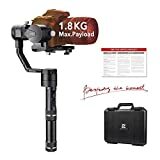 The next recommendation goes to Zhiyun Crane (V2) 3-Axis Handheld Gimbal Stabilizer. 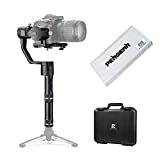 Not very different from other gimbals mentioned above, it can work well with many types of mirrorless and DSLR cameras. The joystick, which lets you switch between different modes, is just at your fingertips. What’s more, the special feature of this product is, it has the button on the handle allowing you to control the camera easily. The camera also comes with an app that you can control this gimbal stabilizer wirelessly. Last but not least, mounting the camera to this tool can be done without the assistance of any tools, too. With this incredible stabilizer in hand, picture taking will be much easier and better. Here comes the great camera stabilizer that is compatible with almost all types of cameras. 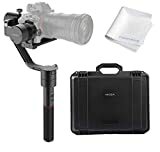 Neewer Crane V2 3 Axis Brushless Handheld Gimbal Stabilizer is well known for the fact that it can be assembled and disassembled without any tools. On top of that, you can remotely access to this device too since it has the Bluetooth and App allowing you to control the camera easily. More than this, for the superb photographing experience, this gimbal stabilizer is also equipped with a 360 rotation brushless motor. We would like to draw your attention to another incredible product which is compatible with many series of DSLR and mirrorless cameras. Its weight is 2.1 lbs. With this product in hand, you can freely take photos from many different angles as it comes with 360° rotation function and a firm grip. More than this, the materials used for producing this product are the high-quality mental, so we can guarantee both the superior and long-lasting quality of the item. This is the slim and stylish stabilizer which is known as DJI Ronin-M 3-Axis Gimbal. Due to its small size, you can store and transport it anywhere. More than this, with the equipment of the remote control, this incredible product allows you to switch the operation modes with ease. On top of that, if you are concerning about the operation process, fear no more, since you can set-up this product in less than 5 minutes. Set up is not difficult either. Finally, we bet this is the right product for achieving incredible photos from different dimensions. The next product which also receives excellent rating is the product which is called Zhiyun Crane V2 3 Axis Brushless Handheld Gimbal Stabilizer. The first significant feature of this tool-less assembly process is, it can offer perfect image results from any angle. Adding to that, this device also allows the users to control it using a wireless connection, too. Please be noted that, with the batteries that come with this product, this gimbal stabilizer can operate for 6 to 12 hours. Wait no more, for the superior quality photos, get yourself this awesome product today. The wait is finally over, here comes the top product on the list today. The OFFICIAL ROXANT PRO video camera stabilizer not only works well with DSLR cameras but also works with GoPros and smartphones. Moreover, you don’t need to worry if your cameras will flip over as it is designed with the firm grip for stabilizing the arm part. Additionally, as it allows the 360 degrees rotation, you can enjoy taking awesome photos from various angles. Provided above are the best-selling camera stabilizers and gimbals available for sale today. Hopefully, the article that we provide will serve you a great deal in gaining more understanding about various types of camera stabilizers on the market. Better yet, it can help introduce to you the camera stabilizer you’ve longed for. Get one today; you won’t be disappointed.